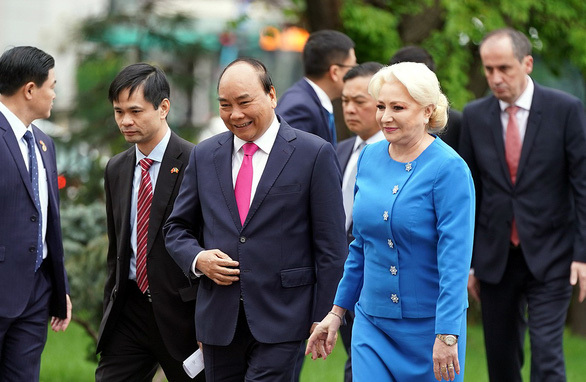 Romanian Prime Minister Viorica Dancila expressed her support for the early signing of a free trade agreement between Vietnam and the European Union during her talks with visiting Vietnamese premier Nguyen Xuan Phuc in Bucharest on Monday. The meeting was part of Prime Minsiter Phuc’s official visit to Romania from April 14 to 16 at the invitation of his Romanian counterpart, according to the Vietnamese Ministry of Foreign Affairs. During the conversation in Bucharest, the two leaders expressed their joy at the positive development of multifaceted cooperation and traditional friendship between Vietnam and Romania over the past decades. The ongoing visit by PM Phuc is an important milestone in the two countries' bilateral relations, the Romanian premier stated. The heads of government discussed measures to further enhance bilateral relations in politics, diplomacy, security and national defense, economic affairs, trade and investment, education and training, labor, culture, tourism, agriculture and food processing. They praised the cooperation between the two countries’ localities over the recent past, taking this as a direction for the traditional cooperation between the two sides. They consented to increase the exchange of high-level delegations and effectively implement existing bilateral cooperation mechanisms, while making preparations for the 70th anniversary of the bilateral diplomatic relations next year. PM Dancila mentioned the Vietnamese community in Romania and their positive contribution to the local socio-economic development. PM Phuc took the occasion to thank his host and the Romanian government for supporting the Vietnamese community. Regarding international and regional issues, the premiers exchanged ideas on the acceleration of bilateral cooperation at international forums and organizations. As the rotary Chair of the European Union (EU), Romania supports the signing and ratification of the EU-Vietnam Free Trade Agreement and the investment protection agreement between the two sides at the earliest possible date, PM Dancila stressed. Both leaders also affirmed the importance of maintaining peace, security and stability for cooperation and development, as well as solving differences and disputes via peaceful means in line with international law. Following the talks, they witnessed the signature of a memorandum of understanding on cooperation in agriculture, animal health, and food safety. PM Phuc also met with President of Romania Klaus Iohannis on the same day.